Have you ever gone back to a show or cartoon that you remembered as a kid, and discovered some inappropriate subtext or moment you didn’t understand until now? Maybe you didn’t even know it was inappropriate in the first place, and you were ok with letting a joke go over your head. I have older siblings, and I remember when they would laugh at jokes I didn’t understand. When I’d ask them what was so funny, they told me “you’ll get it when you’re older”, and that always frustrated me. The world of cartoons is a world of innocence, especially when it comes to superhero shows. In kids’ cartoons, nobody ever gets badly hurt, and the villain never actually kills people. Instead, the villain gets cornered, the hero says some cheesy line like “It’s clobberin’ time!”, and the villain gets put behind bars. It’s a simple and fluid storyline that works every time. But these superheroes were never meant to be portrayed this way, as if they aren’t troubled, or scarred. They’re gritty characters with dark pasts, and they deserve an authentic storyline. But I suppose I have to remind myself that these are kids shows, and the writers are tasked with making them kid-friendly. However, some of these writers are quite subtle in the art of comedy and have sneaked in some jokes for the adults when they’re supervising the kids. In this article, we will go through 30 inappropriate moments you never noticed in kids’ superhero shows. The Flash can move faster than the speed of light, which is pretty neat, especially when you’re chasing down bad guys. However, being fast isn’t always the best thing. In the Justice League episode titled “Eclipsed” Flash proclaims to be the “fastest man alive”, to which Hawkgirl responds “Which might explain why you can’t get a date.” Flash doesn’t immediately get what she meant, until he says, “what’s that supposed to mean?” Sometimes, you want to take your time, work slowly, engage in the little things, do you get what I’m saying? Maybe my readers do, but it certainly flew over my head when I first heard it as a kid. This joke isn’t explicitly suggestive, so I’m sure that if I asked my parents what Hawkgirl was talking about, they could have twisted it in a way that would still be PG. There’s nothing like a little romance between two heroes. It almost seems like they’re made for each other from the get go, because their differences amongst humans is what makes them unique, and if you can’t bond over the fact that you stop crime for a living, then what can you bond over? Enter Hawkeye and Black Widow, who prove to be a really cool dynamic. They’re very similar in terms of combat, and have both worked for S.H.I.E.L.D. In the episode of Earth’s Mightiest Heroes titled “Gamma World”, Black Widow uses one of her electrical bolts and shoots it at Hawkeye’s private area. This stuns him, and proves to be a warning shot for Hakweye, who might just be doing too much thinking with his ‘arrow’, if you know what I mean. Who knew Harley Quinn could be such a romantic? In The New Batman Adventures episode titled “Beware The Creeper”, there’s a scene where Harley Quinn slowly emerges from a giant pie, and serenades The Joker with a song of her own to the tune of “Happy Birthday.” The Joker doesn’t really know how to react, but it seems like he appreciates the gesture. It really does seem like such a sweet and sincere image, that is until Harley asks “do you want to try some of my pie?” and adds “I’m sure you’ll want seconds.” As a kid, you’re innocent enough to know that Harley is talking about how delicious the pie she cooked is. We wear clothes because we need to keep ourselves warm, and also to hide our ‘shame.’ We’ve turned it into a fashion as opposed to just a necessity, and I don’t see anything wrong with looking good. For the ThunderCats, however, clothing might have been optional. In the pilot, the heroes appear in their birthday suits for the first time on screen. Fortunately, there were no extra details depicted, because we don’t want to scar the lives of children everywhere, right? Could we really blame the ThunderCats? I mean, this was the way they were on their home planet. They never needed protective clothing or special garments, but I suppose arriving onto an unknown planet, “blending in” with the locals ought to be a good idea. The Teen Titans series from 2003 was probably my favorite iteration of the show. It was able to simultaneously take itself seriously, while also being goofy and silly. It’s an interesting duality that proved to be a real contender as DC’s best-animated series. Speaking of goofy and silly, there was one episode where the Titans opened a box of toys modeled after themselves. They’re all excited to have their own action figure, and Robin even exclaims that they got all the details just right. Beast Boy takes a closer look at his figure and, to his displeasure, wasn’t happy with all the design elements. Essentially, he looks down the pants of the doll and, seemingly, finds nothing. Who knew that someone who could transform into any animal could be so self-conscious of what he looks like? It must be so hard to be in a relationship where you’re giving it your all, and your partner is too busy to care. Maybe that’s how Harley Quinn feels sometimes. She devotes herself to The Joker, only to be passed up for a blueprint or a scheme on how to defeat Batman. In this scene from Batman: The Animated Series, Harley is seen sneaking up on The Joker, who’s busy working on some plans. She’s clad in her usual makeup, along with racy lingerie. She tries getting his attention, but to no avail, to which she asks “don’t you wanna rev up your Harley?” Now, if there has been a more obvious case of grown-up undertones, I want to hear about it, because this certainly takes the cake. Captain Planet and the Planeteers is an educational cartoon about spreading awareness about the environment, and what we could do to save it. It’s a really great message that anyone in this day and age could get behind. However, there is one episode that seems to take a bit of a darker path. “Mind Pollution” was an episode themed around using corrupt substances and the effects they have on us. It’s strange to see someone actually perish in a kids’ show, because these shows are meant to be safe and guarded in some sense. It’s clear that the episode is really trying to depict a bigger picture. Another unsettling moment in the episode is when one of the planeteers accidentally takes some things and looks visibly insane. You really can’t get away with this stuff in 2018. 23 How About A Ride? In the episode of Batmon Beyond titled “Golem” high school students Nelson Nash and Bobbi ‘Blade’ Sommer are seen in a mall, when Nash says “How about a ride?” Bobbi assumes he’s talking about cars, to which she says “you like that car more than me.” Nash quickly replies “who’s talking about cars?” There’s nothing subtle about the joke, so I don’t think I have to spell this one out for you. This scene might have been edited out of the original run, and for good reason. Firstly, not only is it some of the smoothest smooth talk I’ve seen in a cartoon, it might just be too smooth for TV. I can’t help but say that they should have kept it. I mean, at some point you got to have “the talk” with your kids, so why not have it over a Saturday morning cartoon? I’m just kidding. There’s nothing like it when characters do something out of the ordinary. A villain will show sympathy once in a while, Batman might laugh at a joke or two, and maybe The Flash won’t always make a wisecrack. But in the episode of Batman: The Brave and the Bold titled “Mask of Matches Malone”, the Birds of Prey, consisting of Batgirl, Huntress, and Black Canary, are caught on stage in front of a crowd of gangsters, and instead of starting a fight, they sing a song about having some grown-up fun with the Justice League. They don’t shy away from telling it how it is, with some of the lyrics being “Flash’s foes, they finish last. Too bad sometimes he’s just too fast!”; “Batman throws his Batarang, what a weapon, what a bang.” How this got through censors, I have no idea. Steven Universe is a fairly recent superhero cartoon and bodes on themes of identity and love. It’s also a show that prides itself on its malleability of gender definitions, and its diverse cast of voices. The show is centered around Steven Universe, hence the title of the show, who’s a considerably innocent pre-teen. In the episode titled “Joking Victim”, Steven is talking to his co-worker, Sadie, and she’s explaining how she and her boyfriend spent the night together, saying “he let me be his player 2.” Steven doesn’t seem to know that they are a thing, and interprets this as they were playing games together, to which he replies that it must have been “one great video game”. Sadie’s eyes widened, and she clearly seemed to be hiding something. Subtle adult references in cartoons are usually quite funny. These references were probably intentionally slipped in by the creators, specifically for the adults who are watching these shows with their kids. However, sometimes, they miss the mark by a hefty margin, and end up making a joke that isn’t as funny as it may appear to be. In one episode of The Powerpuff Girls, Mojo Jojo is pictured in a jail cell with another larger figure, who is creepily smiling at him, possibly intent on committing some suggestive acts. The scene itself isn’t graphic, but having to see that, possibly with your child who might not understand the implications, is unsettling. Just because it’s being used for harmless comedy in a kid’s show doesn’t make this any better. We’ve seen countless times how animators tend to show the shapely women in cartoons. It’s a staple that’s been in the industry for years, and we can’t really seem to get around that. But, it doesn’t help when you have a male figure who’s being creepy alongside the raciness. In the episode of the 2003 series Teen Titans titled “Birthmark”, Raven’s character arc begins, and we learn more about the character and her dark past. We see Slade throughout the episode, but we get some creepy undertones when he approaches Raven and says “Hello, birthday girl. Ready for your present?” The really unsettling scene comes when Slade confronts Raven, and shows her the fate the world is destined for because of her. I thought this was a kids’ show! There are many charismatic Marvel characters. Take Tony Stark, for example. A genius, billionaire, and philanthropist with dashing good looks? Who wouldn’t want any of that? Then there’s Remy Lebeau, otherwise known as Gambit. His depiction in X-Men: The Animated Series makes him out to be kind of a flirt. In the episode titled “Night of the Sentinels, Part One” Gambit is seen in the mall buying playing cards. He approaches the cash, and the cashier says, “you must like to play cards” to which Gambit replies “I like Solitaire, okay? Unless I got someone to play with.” Solitaire is a single-player game, and if he’s saying that he wants t play Solitaire with someone else, then it couldn’t possibly mean anything other than some grown-up fun. Spectacular Spider-Man is probably my favorite iteration of Spider-Man in an animated series. It blends the themes of love, drama, action, and comedy all into one synthesized concoction that is really well tied together. Unfortunately, it got cancelled after two seasons due to legal troubles with Disney and Sony Pictures Television. Peter Parker wasn’t always known to be particularly good-looking, but he’s got a lot of charm and wit that proves to be worth more than looks could ever be. In the episode titled “The Uncertainty Principle” Peter is making his way to a Halloween carnival, and decides to wear the Spider-Man suit, because no one is suspicious of him being Spider-Man anyways. Liz Allen and Mary-Jane Watson seem to notice, and Allen says “you can web me up anytime, Petey.” Who knew teenagers could have such a way with words? Have you ever had a conversation with someone, and without realizing it, you said something that might have been, oh I don’t know, detrimental to your entire being? Well that’s probably how The Professor felt after he dropped this line on a little girl. In The Powerpuff Girls episode titled “Superfriends”, the girls introduce Robin Snyder, their new neighbor, to their dad. When Bubbles explains that The Professor made the girls in a lab by accident, Robin replies, with a smile, “Don’t worry, Professor. I was an accident too.” Now, any logical person wouldn’t think that she was also made in a laboratory by accident, so it could only really mean one thing. It must be quite sad for a child to admit that to someone else, let alone even have knowledge of such sensitive information. 14 Green Canary Or Black Arrow? The relationship of Black Canary and Green Arrow has experienced its share of adaptations, from the comic books, to live-action, and to animated series. Since the pilot of Justice League Unlimitied, Green Arrow has had his eye on Black Canary, and for an expert archer, there’s no way he would miss. In the episode titled “The Cat and the Canary”, they finally meet and have a one-on-one. Not necessarily a date, but a fun exchange brimming with romantic tension. The scene is set with Green Arrow going at a punching bag, until Black Canary enters, and asks “you happy punching the bag, or you want to go a few rounds with me?” Arrow’s eyes widen, to which Black Canary responds “I am talking about sparring”, and Arrow counters with “that’d be nice too.” I don’t think anyone has to tell them to get a room. Sometimes, appealing to audiences’ need for character accuracy won’t always work, especially when it comes to certain assets that heroines possess. For example, Black Cat, whose shapely appearance in the comics would not be upheld in the same manner in a children’s cartoon. But, if there’s one thing that the children cartoon adaptations have kept, it’s their cheeky dialogue and sharp wit. In the episode of Spectacular Spider-man titled “Persona”, Spider-Man is trying to stop Black Cat in the midst of a crime. At one point, Spider-Man shoots some web on her hand, to which Black Cat responds, “oh you better not get your goop in my hair.” She’s obviously taking a jab at Spidey and a certain grown up substance. Also, to add on to this hilarious scene, Spider replies with “don’t worry, it comes off with ice or peanut butter.” A helpful tip for the viewers, just in case. Tony Stark is always coming out with new looks for his Iron Man armor. As a side note, my personal favorite is the Iron Patriot. 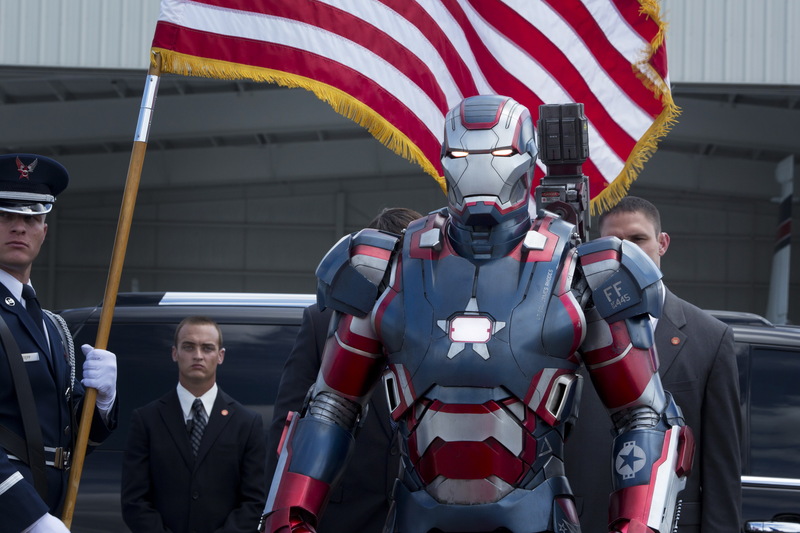 Nothing says “America” like a battle suit in the color scheme of the American Flag. These iconic looks are a staple of Iron Man’s series of battle suits. However, in an episode of Ultimate Spider-Man, Iron Man appears in a suit with a nosepiece. Despite the small detail, it creates a stark difference in the suit’s look. Things take a weird turn when Iron Man goes on to explain that he was going through an ‘anatomic phase’, promptly saying “you should see the one with…” before being rightfully interrupted by Spidey. Presumably, Iron Man was going to tell Spidey about his more ‘inspirational’ prototypes. Warner Bros.’ Freakazoid takes the quirkiness and kookiness of typical Warner Bros. shows like Animaniacs, Looney Tunes, and Pinky and the Brain, and elevates them to a level that parodies superheroes. The show features its share of wacky and zany humor, and of course, as it is typical of the 90s, an adult reference here and there. In one episode, Freakazoid is talking to one of his sidekicks, Sergeant Cosgrove. He asks Cosgrove “why aren’t you married?” to which he replies, “I like meat too much.” I don’t think it’s incredibly obvious, especially to children, whose innocence might lead them to think that Cosgrove would choose a filet mignon over his wife. However, if you connect the dots, you’ll realize that it means he swings from a different side of the batter’s box. The credo that superheroes must keep their identity a secret must be tough to maintain. Part of you is a hero that is heralded as a symbol of goodness and hope, but your other half is underneath the mask, and is continuously neglected. That duality must be heart wrenching as a teenager, especially one as scorned as Peter Parker. He doesn’t always command the respect he deserves. But if you’re the Peter Parker in Spectacular Spider-Man, you continue to surprise yourself as you attract the attention of many beautiful women. In one episode, Liz Allen gives Parker a hug, and a classmate warns her to be careful as “geekitude is contagious”, to which Allen replies “I don’t mind catching what Peter’s got.” Who knew Parker had it going on? The Powerpuff Girls episode “Members Only” brings out some really suggestive themes. It’s the type of episode that would draw the last straw for being cut on mainstream cable today. I would suggest watching this clip from the episode, it might put things into context. So, the girls want to join a club called the Association of World Super Men. It is an exclusive all-male organization of superheroes, so naturally because the girls are female, they can’t join, and are asked to leave. This brings out the arrival of Mascumax, an overly-masculine robot alien with protruding chest hair who feeds off the expulsion of manliness. Yes, that’s a paraphrase of a line from the show. He even goes on to say, “the more manhood you bring against me, the harder I shall become.” To boot, the girls take on the power of a giant cat to beat him. Need I say more? 8 How Do You Get Away With That? Superheroes are fighters for the good of mankind, and bring justice to any evil that sprouts in the way of that prerogative. But it’s not like superheroes aren’t capable of hatred or scorn. The 90s animated iteration of the X-Men proves my point, when Rogue gets away with a slur. The team is sitting a courtroom where Graydon Creed, the child of Mystique and Sabretooth, is giving a statement about “Mutant Rights.” His speech goes awry when one of the judges interrupts him and asks him to sit down. Rogue decides to insult him and calls him a peckerwood, which doesn’t set off any alarms for the rest of the X-Men. If you didn’t know, peckerwood is a, of course, slur describing white people who don't have money. The fact that this got through censors boggles my mind. The Ripping Friends is a parody of superheroes, and gives off shades of Ren & Stimpy with its grotesque humor and animation. The show depicts four superhero brothers who fight strange abominations bent on giving the brothers a hard time. In one particular episode, they have a segment called “Rip-A-Long with the Ripping Friends” where they answer questions. The kid asks, “why do hot-dogs come in a pack of twelve, but buns come in a pack of eight?” It really is a good question, so the brothers decide to tackle this issue. Upon solving the issue, they ask the CEO of the Hot-Dog company, who happens to be a hot-dog, and the CEO of the bun company, who happens to be a bun, to hug it out. When they do, well, let’s just say the animation speaks for itself. One’s a hot-dog, one’s a bun. Do the math. With all the subtle humor appearing in this list, this is probably the one that is the least subtle. SWAT Kats: The Radical Squadron was a Hanna-Barbera production that only lasted for two seasons, and one episode in a third season, totalling 25 episodes. The show was about two cats, T-Bone and Razor, who are ex-members of a paramilitary enforcement agency, known as the Enforcers. They decide to defend the city in secret as the SWAT Kats. In one particular episode, T-Bone and Razor are conversing, when T-Bone says “no doubt about it, Razor. You are once macho cat.” The show cuts to saying “Ain’t that the truth.” The worst part is that the camera pans to him patting himself in a highly personal area. This moment got through censors. Let that sink in. The series finale is always the toughest part of any TV show. You’re either a combination of happy and sad because the show is ending, but on a good note. Or, you’re either frustrated and livid because nothing is resolved, the series is ending, not because the creators decided that, but because it got cancelled. In the Justice League Unlimited series finale titled “Epilogue”, Amanda Waller is talking to Terry McGinnis about cloning a new Batman. She said that his DNA was easy to find because “it was found all over town.” McGinnis raises an eyebrow, to which Waller replies “not remotely what I meant.” Without Waller’s retort, I wouldn’t have known she was making an innuendo. I suppose it’s an innuendo that’s so subtle you wouldn’t even know it was one to begin with. As a child, my innocence kept me safe, so I never knew if something seemed “wrong” or not unless I was told. But sometimes, I’d get a feeling in my gut that would tell me “maybe I shouldn’t be watching this.” Enter Sym-Bionic Titan, a show about a trio made up of an alien princess Ilana, rebel soldier Lance, and Octus the robot, who all attend high school and fight giant robots. In the episode “Lessons In Love” there’s a scene that pushes the PG rating to another level. The scene has Kimmy, a cheerleader, doing an ‘elaborate’ dance routine that probably shouldn’t belong on the Cartoon Network. When you have an original song with lyrics such as “shake it, bake it, booty quake it!” for a kids’ show, something might be off. 3 How Many Ways Can You Say It? Just because I’m an adult doesn’t mean I understand all things grown-up. I roughly understand how to do taxes and fill out a resume, but I have absolutely no idea how to balance a cheque book. So naturally, there are some things that go over my head, but I never expected something from a children’s cartoon to do that. In an episode of Sonic SatAM titled “Sonic Racer”, there’s a scene where Bunnie, a rabbit with a Southern accent, appears to be reading a bedtime story about a wolf to Tails. When she’s done, Tails remarks that the wolf is nasty, to which Bunnie responds “nastier than a one-eyed snake.” Now, apparently, “one-eyed snake” is slang for, well, you can figure it out. This somehow got past the censors, but maybe it’s because Bunnie is Southern, so “one-eyed snake” is probably a Southern thing. TV shows like Ren & Stimpy or Cow & Chicken will never see the light of day on any PG network, mostly because they’re incredibly suggestive and grotesque. Mighty Mouse: The New Adventures revamps the 1940’s cartoon character Mighty Mouse, and is credited as the pioneer of “creator-driven” animation. However, there was only so much room for “creator-driven”, and sometimes you get results that might not have been favorable for a children’s cartoon. In one episode, Mighty Mouse is seen consuming a strange substance pulled from his pocket. The creator, Ralph Bakshi, told the studio that he was inhaling a crushed flower, but parents thought otherwise, and were thinking that Mighty Mouse would influence kids to go out of their realm. This controversy led to the show’s collapse, only lasting two seasons.